My picture here is supposed to resemble a mug shot. Yes, Hershey’s Milk Shake you are in big trouble. Before I continue, if you don’t think I feel a bit ridiculous complaining about snacks after our nation’s latest tragedy - I do. I don’t want you, dear reader, to think that I hadn’t noticed what happened in Newtown, CT. But, my job is to talk about food and I am sticking to it to calm myself down. Every year, I elect myself to choose the "Worst Snack of the Year". One of my early choices, the Hostess Fruit Pie, no longer exists. Maybe I had something to do with that? Now, I will vent some of my anger on this flavored milk that I unwittingly purchased for my children, ages six and eight. They saw this in a deli where we were buying a sandwich and I thought it was flavored milk. Flavored milk is a treat for my kids, though they purchase it at school. The school has a lower added sugar variety called “TruMoo” that has about 15 grams added sugar per 12 ounces. They only buy 8 ounces so they get 10 grams of added sugar (or 2 teaspoons). 50 grams of sugar!! For 12 ounces of milk, you would expect about 16 grams of sugar from lactose and then Hershey’s decided to add 34 grams of sugar - just under 7 teaspoons of sugar. In one serving there are 10 teaspoons of sugar. Another problem is the packaging. See those lovely strawberries? There are three of them on the outside and the whole container is strawberry red. Ummm, strawberries??? Nope. I do see “natural and artificial flavors” and to Hershey’s credit it does say “strawberry flavored” and not “real strawberries”. I guess since you didn’t use strawberries now we need RED #40 and BLUE #1 to make it pink. This has an obscene amount of added sugar. The label makes it seem like it has fruit in it. Zero fruit. People, like me, might think this is regular flavored milk if they are busy. I find this product misleading and I think it is just plain unnecessary to add so much sugar. While there is the added benefit of milk (versus soda) of protein and calcium, the rest of the product is terrible. 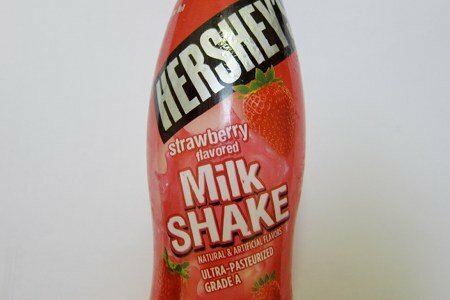 My advice is to be sure that you buy "Strawberry Flavored Milk" and not a "Milkshake" if you can remember that. Argh. Not to mention the 360 mg of sodium!!!!! Ewwww!! I can see why it is the worse snack! It sounds gross!! I can't believe Hershey's would make something so bad, well I guess I can. I heard there chocolate is made with lard! Gross!! Well I will add that the milk is no good either. Milk makes your body acidic...and your body naturally strips calcium from bones to balance the acid level. To think you are gaining calcium from milk is a joke. We consume more milk and dairy than any other country and have the worst osteoporosis rates. Thank you Snack Girl for making people think twice before they buy something. I wish I didn't have to read the ingredients in every single thing I buy, but that is the case if you don't want all the additives, not to mention all the sugar and salt that companies feel they have to add for the public to buy. I try to do the 5 ingredient rule, but it's not always an option. Annette- I've heard that before and I'm not sure I believe it. Do you have a link to a study? Oh god, that's just gross. Even as a kid, I didn't want to eat that! Hi Andrea. Yes, the China Study is the biggest...but there are many. That's the biggest, lengthiest study (over years) in history on a plant-based diet and there is plenty of research there. Amazon has the book. Erin...makes sense...dairy is certainly not the only cause; many things cause an acid level in the body...meat, soda pop, etc. which leads to leaching calcium from the body. Overall, the American diet is acidic...which creates a breading ground for disease of all kinds. @Andrea (I hope Annette doesn't mind my stepping in here)- I think this http://www.nytimes.com/2009/11/24/health/24brod.html may help with some cited studies. "Bones are the storage tank for calcium compounds that regulate the acid-base balance of the blood, which must be maintained within a very narrow range. When the blood becomes even slightly too acid, alkaline calcium compounds — like calcium carbonate, the acid-neutralizer in Tums — are leached from bones to reduce the acidity. "The researchers note that fruits and vegetables are predominantly metabolized to alkaline bicarbonate, whereas proteins and cereal grains are metabolized to acids. The more protein people consume beyond the body’s true needs, the more acidic their blood can become and the more alkaline compounds are needed to neutralize the acid. "The Dawson-Hughes team concluded that increasing the alkaline content of the diet by eating more fruits and vegetables should be studied as a safe and low-cost approach to preventing osteoporosis and improving bone health in older Americans. Not to mention all the other additives. 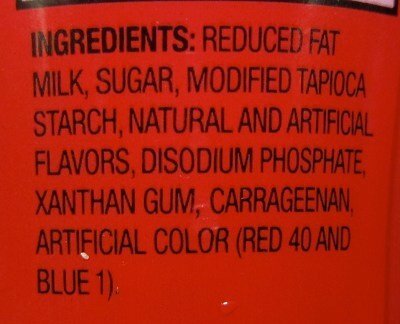 Carrageenan is a carcinogen. Don't mind at all Andy! Thank you for contributing. The more awareness there is, the more things can change. There is a lot of money behind the dairy industry and we have been so trained to think "milk, it does a body good" that it's hard to think otherwise. Truth is, we have to educate ourselves about our health. If someone wants to eat animal products of any kind, that's clearly their choice, but I contend that we should all get the facts and not follow (biased) industry guidance to do so. Nobody is getting a Strawberry Milkshake. Hijack away. I literally gasped when I saw the sugar content! A treat once in a great while is okay, this is exorbitant, but it is not marketed as nutritious, like some yogurts that have just as much sugar per ounce. I hope people are learning to read their labels! Thank you. I'm a grandmother and may not have double checked "milk" if the girls asked for it. I think you're very wise not to comment on the news. As tragic as it is, your site is not a news site, it's a reference site where people come to look for food info, recipes, etc. - and that's excellent! Good for you for keeping yourself focused! 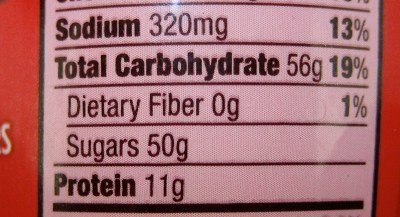 And the carbs at 56g, that is equal to 56 spoons of extra sugar added to the 50g of sugar already in it. Yipes 106g total of sugar in one serving. Hopefully this will disappear too. @Christine L. - Thank you for the positive feedback. I have been struggling with what to do because I am a writer with an audience. I am glad you liked my solution which was to acknowledge - and not comment - on the news.